Hamas leader Mahmoud Zahar said Thursday he is ready to maintain a cease-fire with Israel forged in February 2005 if Israel does likewise, following its upset victory in parliamentary elections, but the U.S. says it still considers Hamas a terrorist organization. "If they are going to continue commitment to what is called quietness, then we will continue," Zahar said in an interview. "But if not, then I think we will have no option but to protect our people and our land." Meanwhile, Secretary of State Condoleezza Rice said Thursday the U.S. position on Hamas as a terrorist organization has not changed, despite the militant group's stunning victory in Palestinian elections. "You cannot have one foot in politics and another in terror," she said. "Our position on Hamas has therefore not changed." "A political party that articulates the destruction of Israel as part of its platform is a party with which we will not deal," President Bush said later Thursday during his news conference. Palestinian leader Mahmoud Abbas will ask Hamas to form the next Palestinian government after the Islamic militants swept parliamentary elections, and the defeated Fatah Party will serve in the opposition, a senior Fatah legislator said Thursday. Prime Minister Ahmed Queria's government resigned Thursday. "This is the choice of the people. It should be respected," Qureia said. The Cabinet remained in office in a caretaker capacity. "One thing for sure: This is a month people in the Middle East will remember," says CBS News correspondent Dan Raviv, who covered the Mideast and has written several books on Israeli intelligence operations. "Israeli politics, thrown into turmoil when Prime Minister Sharon had a stroke and remains in a coma, and now on the Palestinian side, a party widely considered to be a terrorist group wins this election." Initial exit polls had forecast a slight edge for Fatah, with Hamas coming in a strong second. The polls predicted that neither party would have a majority and would have to rely on smaller parties to form a coalition. Palestinian pollsters were at a loss to explain the discrepancy between the exit polls. Many voters said they had been afraid to admit to pollsters they had supported Hamas, fearing retribution. "It's almost like the 1948 U.S. election when supposedly first Dewey won and then Truman," Brookings Institution Senior Fellow Michael O'Hanlon said on CBS News' The Early Show. Asked if a Hamas-run government would enter peace talks with Israel, Zahar said there that even prior to his party's apparent election success, there had been no movement toward peace and therefore, there is no point to hold dialogue at this time. "We have no peace process," he said. "We are not going to mislead our people to tell them we are waiting, meeting, for a peace process that is nothing." "The peace process wasn't going anywhere anyway," agreed Brookings' O'Hanlon. "Peace is never dead," said President Bush. "If we look for a silver lining we can see it did not really win because of its terrorism per se," but for the welfare services it has provided for Palestinians, O'Hanlon told Early Show co-anchor Harry Smith. There was also "frustration with the incumbent regime has been so great because it hasn't really delivered." President Bush said the results were a "wakeup call" to the Palestinian leadership that people "were not happy with the status quo." Zahar promised a complete overhaul of Palestinian public services and administration. "We are going to change every aspect, as regards the economy, as regards industry, as regards agriculture, as regards social aid, as regards health, administration, education," he said. 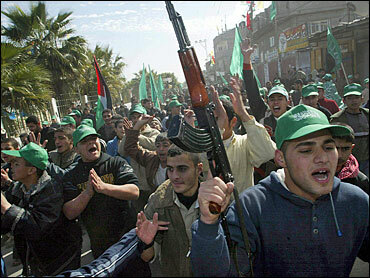 Ordinary Israelis consider Hamas' victory a bad sign, reports CBS News correspondent Robert Berger. There was no official comment from the Israeli government. Acting Prime Minister Ehud Olmert said Wednesday, before Hamas claimed victory, that Israel cannot trust a Palestinian leadership in which the Islamic group has a role. "Israel can't accept a situation in which Hamas, in its present form as a terror group calling for the destruction of Israel, will be part of the Palestinian Authority without disarming," Olmert said in a statement issued by his office. Hamas must moderate its position on Israel, said Rice, if it wants a Palestinian state. "Those aspirations only be met through a two-state solution which requires the renunciation of violence and turning away from terror and accepting the right of Israel to exist," she said. Palestinian legislator Hanan Ashrawi, who apparently was re-elected on a moderate platform, said the Hamas victory was a dramatic turning point. She said she is concerned the militants will now impose their fundamentalist social agenda and lead the Palestinians into international isolation. She said Fatah's corruption, Israel's tough measures and international indifference to the plight of the Palestinians were to blame for Hamas' strong showing. Washington miscalculated in pushing for the vote, as part of its pro-democracy campaign in the Arab world, she said. "The Americans insisted on having the election now, so they have to respect the results of the election, as we all do," she said. U.S. election monitors led by former president Jimmy Carter said Thursday the parliamentary elections, the first for Palestinians in 10 years, went well. "Election day was generally peaceful and the elections thus far appear to be well-administered under the difficult circumstances of ongoing conflict and occupation," said a statement. Turnout was heavy, with nearly 78 percent of 1.3 million eligible voters casting ballots. Polling stations were heavily guarded, and there were no reports of major violence.